Second quadrant of the Space Oblique Mercator applied to the ellipsoid. 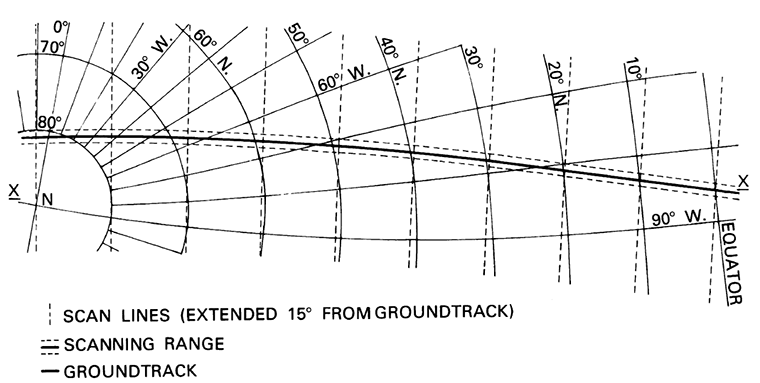 Heavy line indicates satellite ground track. Jun 26, 2014 • To continually map the Earth’s surface using Landsat data, an entirely new projection had to be created. This new projection was created by John Parr Snyder and is known as the Space Oblique Mercator (SOM) projection. It is considered, “one of the most complex projections ever devised” according to cartographic historian, John W. Hessler. Referencing the centers of Landsat scenes to a map was not especially difficult; finding a way to lay actual scene data onto a map projection of the Earth was an entirely different matter, one that wouldn’t be completed until just prior to the Landsat 3 launch. Upon recognizing that multispectral scanner (MSS) data could be used for cartographic applications, Colvocoresses (Colvo) and other cartographers realized there were no available map projections suitable for mapping Landsat data; the mathematical equations necessary to transform the data directly to common projections didn’t exist. An entirely new projection was needed—one that accounted for the Earth’s rotation and orbital precession together with Landsat’s orbit and the MSS scanner sweep. Colvo worked on the general geometry and named the conceptually-defined construct the Space Oblique Mercator (SOM) projection. The challenge was on to develop a SOM transformation equation with these variables. The task proved to be extremely complex. Both NASA and USGS were unable to find a mathematical solution. At the 1976 conference “The Changing World of Geodetic Science” held at Ohio State University, chemical engineer and cartography hobbyist John Parr Snyder heard Colvo’s talk on the elusive SOM. But it wasn’t until the next year (after seeing a correspondence about the SOM between Waldo Tobler, a giant in the cartographic world, and Colvo) that Snyder decided to work on a SOM solution. This entry is filed under News, Technical Information, Throw Back Thursday.